Jed Lowrie hit a tiebreaking double before Texas slugger Adrian Beltre left with a hamstring injury, and the A's beat the Rangers 3-2 on Tuesday night, tagging Cole Hamels with his fourth loss before the end of April for the first time in the left-hander's career. 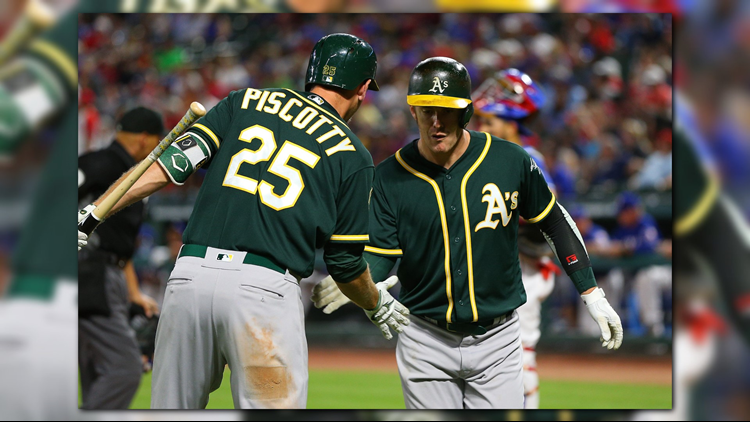 ARLINGTON, Texas (AP) — The Oakland Athletics keep finding ways to win after their slow start. The Texas Rangers can't stop losing — games and key players. Beltre strained his left hamstring coming out of the batter's box in the eighth inning and limped to first base on what would have been a double but was instead a single for his 3,075th career hit. "We already have our key players hurt on the middle infield," Beltre said. "We didn't need another one. It's no secret we've been struggling offensively. We're trying to find a way to get through it." "It's gut-wrenching, to say the least," said manager Jeff Banister, whose Rangers (8-17) have matched their second-worst 25-game start and are 3-12 at home. "However, I'll continue to say this: There is no timeout. We'll continue to play." Lowrie's seventh-inning liner over the glove of a diving DeShields came against reliever Matt Bush after two doubles off Hamels in an inning that included a pair of Oakland baserunners getting thrown out at third base. Andrew Triggs (2-0) allowed one run in six innings with six strikeouts, and former closer Santiago Casilla pitched a scoreless ninth for his first save in Oakland's eighth win in nine games since a 5-10 start. "There's no coincidence that we've been winning games when we've been getting starting pitching six innings or more," manager Bob Melvin said. Hamels (1-4) gave up two runs in 6 1/3 innings and hit three batters, matching the 2008 World Series MVP's career high set on April 20, 2016, in a 2-1 win against Houston. Rangers reliever Jake Diekman also hit a batter. Mark Canha broke a scoreless tie in the sixth with his third homer, a solo shot that went in and out of leaping right fielder Nomar Mazara's glove just above the fence. Matt Olson hit an RBI double in the eighth. Beltre's liner to the gap when he was injured was a single that scored Shin-Soo Choo from first. Beltre had two hits and both Texas RBIs, the other coming on a sacrifice fly. Rangers: RHPs Tony Barnette (right shoulder inflammation) and Tim Lincecum (blister) threw live bullpen sessions. Banister said Barnette probably won't return before Friday. Lincecum is on the 60-day DL. RHP Kendall Graveman (0-4, 10.07 ERA), Oakland's opening day starter, has allowed at least four runs without throwing more than five innings in all five starts, the longest such streak to begin a season for an A's pitcher since at least 1908. RHP Doug Fister (1-2, 3.59) is scheduled for Texas in the series finale as he returns from a right hip strain. His most recent start was April 9.